At Mullinax Ford West Palm, we understand you have no shortage of options when you are on the hunt for a new car near West Palm Beach, FL. That is why we do our best to prove we deserve your patronage every day. We are a part of the Mullinax Auto Group that has sold over half a million cars over the past 40 years, which means we have experience to draw on and an acute understanding of what the modern driver wants from his or her car-shopping experience. As such, we offer Up Front® Pricing, an impressive selection, and friendly, honest salespeople who can help you find the car you need at a price you can afford. Do not stress about buying or servicing your car; simply come to our Ford dealership in Lake Park, FL, and let us do all the hard work for you. We make it easy to want to come back to us again and again at Mullinax Ford West Palm. Talk to our Ford experts and enjoy perks like free Wi-Fi and free coffee while you are at our dealership. Want to drop your car off and then continue with your daily routine? We also offer free rental vehicles and a free shuttle service to our customers. We even give new customers their first oil change for free! Whether you want to browse our extensive selection of new and pre-owned Ford models or you simply want to purchase or lease the one that has caught your eye quickly and efficiently, we are here for you. 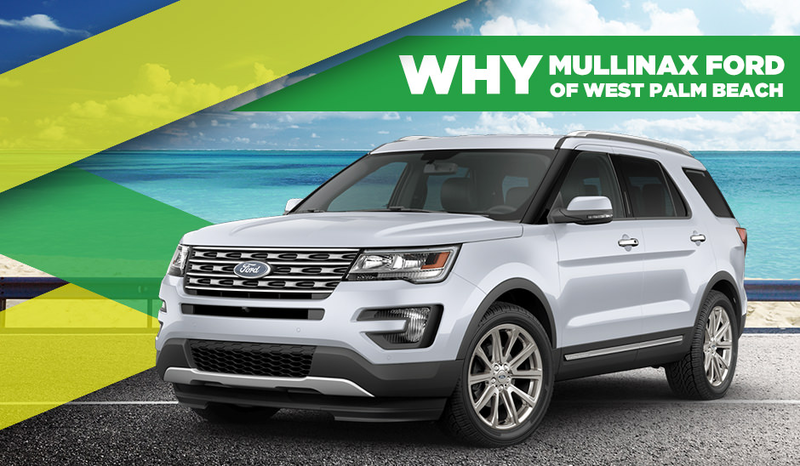 Looking for more reasons why you should buy from Mullinax Ford West Palm? We offer Up Front® Pricing that lets you buy with confidence and puts your mind at ease when you come to our dealership. Our prices are non-negotiable, and you never have to haggle! Mullinax Ford West Palm earned the Motor Company President's Award in 2016, our fifth time winning the award overall. We are serious about being the best dealership we can be. We do not spring dealer fees on you at the last moment. The price you see is the price you get. The Mullinax Group sold over 5,000 vehicles in 2016 alone. We know what people want, and we can make you our next happy customer. Our dealership group is committed to the community. We support yearly drives to benefit the public schools in our areas! You are sure to be impressed by the selection of new and pre-owned Ford models on our lot. Browse them online, then discuss your favorite with our finance team. Our dealership offers impressive facilities and convenient sales and service hours in order to best meet your needs.